Frida in Palma is an apartment building. 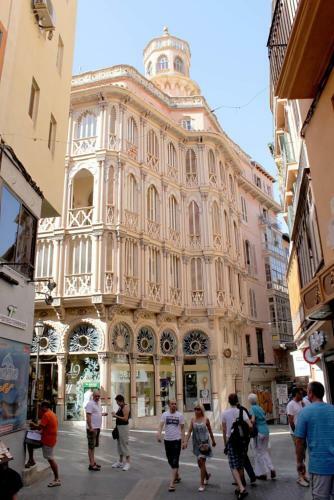 Well situated in the Old Town of Palma de Mallorca, Frida is within a short distance of Plaza Mayor and Palma Cathedral. The property is 3.1 km from P...alma Port. Opening onto a balcony, the apartment consists of a fully equipped kitchen and a flat-screen TV. Palma Yacht Club is 3.1 km from the apartment. Palma de Mallorca Airport is 10 km from the property. When would you like to stay at Frida? A damage deposit of EUR 400 is required on arrival. This will be collected as a cash payment. You should be reimbursed within 14 days of check-out. Your deposit will be refunded in full via bank transfer, subject to an inspection of the property. This property will not accommodate hen, stag or similar parties. Please inform Frida in advance of your expected arrival time. You can use the Special Requests box when booking, or contact the property directly with the contact details provided in your confirmation. Credit cardholder must match guest name or provide authorization.